Traveling is a funny thing, as in the end we didn't even go to the Phi Phi Islands. It was raining in Phuket, and after a leisurely breakfast, we realised that the last ferry of the day was at 10am. Immediately after stepping off the plane into the thick, heavy night air of Bangkok, I thought to myself that Thailand was not defined by what I could see, the instagrammability of it all, but what it made me feel. The visceral heat, that great heat, rushing over us, relentless and foreign, has coloured every memory I have of Thailand. We spent the first and last week of our month-long sojourn in Bangkok, using the first few days to check off the Lonely Planet recommendations for a trip to the city. We shuffled alongside thousands of tourists in the Grand Palace and its surrounding temples, sweating and sun-stroked. But by the third day, we threw away the guidebook and decided to see where the Skytrain, a metro snaking through the city on its great concrete legs, would take us. We decided to get off at Siam station, where it would seem most Bangkok locals ended their journey. We were completely unprepared for what was outside once the doors opened. A web of civilian walkways spread out in every direction, elevated over the busy streets below like branches of a palm. They led directly to air-conditioned luxury shopping plazas (I recommend Siam Park for an afternoon of shopping and a movie), street-side food markets (the one outside the bustling MBK Center is great), past stately government chambers, and hidden backstreets humming with steaming vents and stray cats. 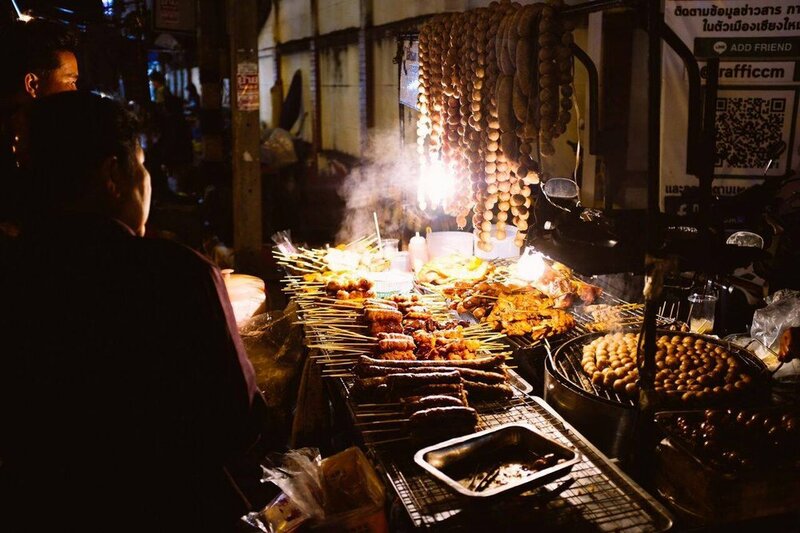 The smell of grilled fish, and the thick scents of lemongrass and lilies was enveloping, a scent so unique to Bangkok and one I've found myself missing. We took the Skytrain to Lumphini Park, an immense green space in the middle of the city with a slightly wild feel to it. We spent a good amount of time trying to outrun a water monitor, and we also visited the Jim Thompson House, which was one of my favourite moments in the city, with its gorgeous teak architecture and canopy of palm fronds. (We took the tour, which is a must if you go - the story of Mr Thompson is like something from a sordid spy novel!) We ended the week with rooftop drinks in the tallest sky-bar in the city. The drinks were £20, but the view of the city and the warm breeze on your skin as the sun set into a deep red over the Chao Phraya River was pretty special. We then flew to Chiang Mai, Thailand's jewel of the north, nestled high up in the green mountains where the air is a bit cooler, the life a bit slower. It's a lovely city: golden temples sit next to almost unbearably chic cafés (go to Graph if you want to re-evaluate every coffee you've ever had in your short, silly life), side streets are overgrown with mango trees and filled with stray cats, and the old, crumbling canals surrounding the inner city act like a protective border. Every day we had a breakfast of sticky rice wrapped in a banana leaf before we set out by foot (or we took a ride on one of the distinctive red trucks - you hop on and off the back and hope the driver slows down enough for a soft landing) to wander the streets. I was enamoured with the Buddhist temples in Chiang Mai, my favourite one being the Wat Phan Tao temple with its gold-laden shrines and blooming cherry blossom trees that carry a deep sense of serenity. The aura of the cherry blossom trees continued through the foot massages and the sweetly cold bingsu we had afterwards. To wake us up, we headed to the lively bars in Nimman, which is essential as the city is known for its craft beers (though be prepared to spend lots of baht if you want something other than Singha or Tiger). And of course, one can't go to Chiang Mai without making an elephant friend or two, so we took a day off to feed some gentle ladies sugarcane and bathe them in the warm jungle rivers of the Baanchang Elephant Sanctuary. With elephants still on our minds, we travelled by plane southward to Phuket to spend our final week in Rawai, a somnolent seaside town on the far southern side of the island, which is also favoured by expats (who could be seen watching the football with a beer in their hand in the shaded beachside bars). Rawai is framed with gently swaying palms and bobbing boats waiting to take visitors to the islands dotted along the distant horizon. We rented a car upon learning the prices of taxis in this part of the country, and after nearly clipping a parked van's mirror (followed by a few panicked minutes of learning how to drive on the left side of the road - the laws for renting here are very lax), we were off. It's a special thing, driving in Phuket, as you share the road with mobs of mopeds, weaving in and out and around you; there's a very distinct measure of chaos to offset the languid mood of the island. We braved the twisting cliffside gravel roads to visit the Big Buddha, a monumental ivory-white statue gazing serenely over Phuket Town on top of its mountain perch. 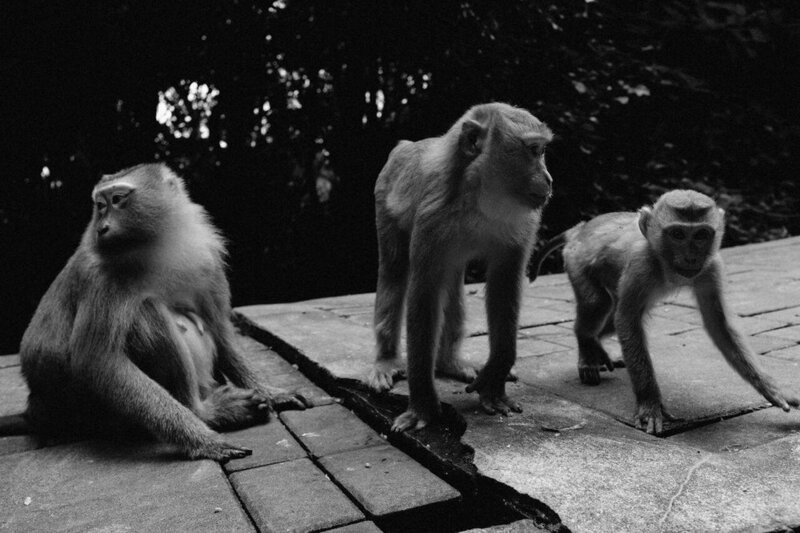 We made quite a spectacle of ourselves at Monkey Hill, running from cheeky macaques expecting a snack or two. An essential stop was made at the Chalong Bay Rum Distillery, where a shot or two (or three!) of pure sugarcane rum was had under a thatched palm roof during a game of dominoes. And days upon days (and sunburn after sunburn) were spent lounging with the azure Phuket sky above us and the bleached white sand below, as we were nipped by gentle jellyfish in the crystal waters while sipping mojitos out of coconuts. During my stay in Thailand, I kept remembering a line I read somewhere a long time ago. To die in wild rivers. To both leave oneself behind and surrender your body and senses to the present, the immediate place that you are experiencing; to give a part of yourself to the foreignness, the wildness of the land. 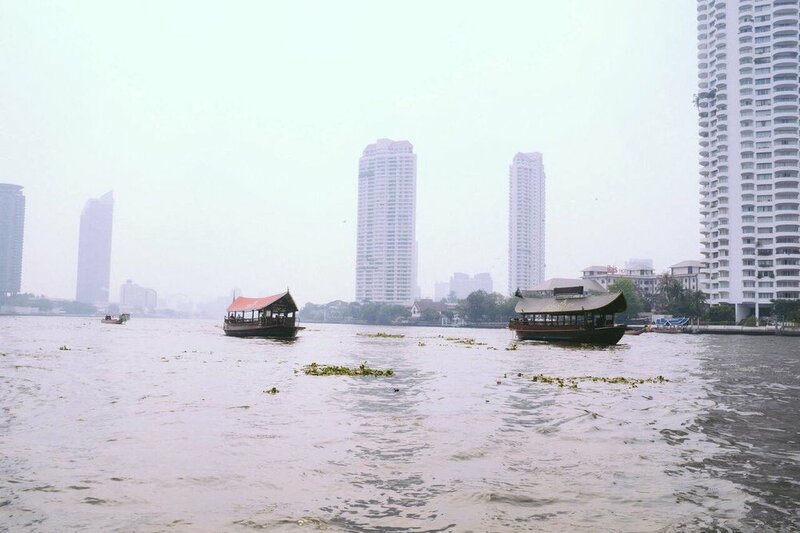 Just before leaving for the airport, we said goodbye to Bangkok by taking a long-tail boat down the dark and lily-padded Chao Phraya River, pink dusk rushing over the dense urban spaces on its either side and the familiar heady scent of spice and blossoms making the air thick. The sites and monuments and tour guides were fantastic indeed, but it was the brief moments of the quotidian, like a boat ride down a river, that I remember most about Thailand. The sudden lily-orange bursts of colour from a monk's robe, winking in and out of a crowd; the silent concrete highways merging with the jungle overgrowth; Thai boat noodles and a Tiger beer had on red plastic crates on a humid night; the deep bow of a passing stranger's 'Sawadee ka!' on the street; long tendrils of smoke from burning temple incense; the cool sensation of nam montr (holy water) on the forehead from a monk's bowl; the kaleidoscopic rush of sitting on the backseat of a tuk-tuk at night. The hot air rushing over you: dangerous, golden, intoxicating and wild.